We’ve been busy going to language school everyday. We are improving and have moved onto the future tense! Our friends from Ireland have arrived (Peter and Karen) and they are also studying before they go off to Oruro. Last week we went to visit a prison workshop, for women and their children. The project helps them to pay for their cell by teaching them how to make “handicrafts” which are sold in the town. We went one afternoon to do a puppet show and taught them a song…. in our limited Spanish! We will also be leading a drama workshop at the language institute on Wednesday. The weather here is hot (about 32 degrees today) and it gets windy in the afternoon. We are starting to apply for our visas which is a long and complicated process here in Bolivia. There seems to be so much red tape, it may take as long as 8 months. How are you?? Im missing you Soooooooo much!!! Hope ur well and loving every minute over there… It was a shame i couldnt be at Xcite when u had the fone call… whats that thing it was on?? maybe i should do it lol!! Im having a sleepless nite so I’ve been praying for you both (its now 4.45am!!!) not had a wink yet! I know that its difficult for you to see such poverty and the ‘fall out’ that comes from people being so poor, but you both carry with you the ‘love light & hope of heaven’ which is priceless, and thanx 2 Jesus is on offer to all… regardless of wealth! Every step you take is another step claiming Bolivian turf for Jesus! So name it and claim it!! I pray that God will bless you richly with His gift of knowledge, wisdom and tongues (spanish especially!) as you serve Jesus in reaching souls for the Kingdom. Run this race so as to win it guys! Your ‘dad’ is cheering you on from the sidelines and so are we! Your newsletters are great. 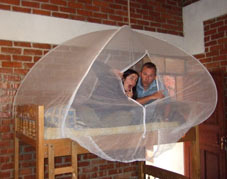 I like the piccy of teh mosquito net, which i am sure is very important…nasty things those insects! I am missing you and it seems very weird without you. Everyone else in year 6 is really missing you and year 5 think that they have missed out on a treat . Mrs Morgan is a wonderful teacher and I am getting much better at maths now. I went ski-ing in Stoke with Suzy Murphy, Katie Reynolds and Ella Williams. We were in the A team. We came 4th and it was so much fun. its izzy brown here! abbots hill is different without you and we all want you back! I think the children in bolivia are lucky to have you and dean. Everyone really misses you here and really want you to visit as soon as you come back! I am no longer in st nicks as i have moved up to baird houseand i love it!